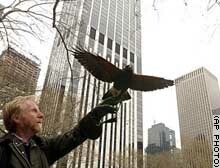 I got a first hand look at Bryant Park’s hawks in action today. There were two working as far as I could see. I’m not sure how effective they are since the pigeons seem to have as much attitude as the rest of the park’s visitors. One of the birds did seem to take a liking to a guy walking through the park, maybe he looked like a big pigeon.